Today is the final day of hiking in Rogers Pass for this trip. The morning is brisk and cool but sky is clear and most of the smoke from the huge fires in central British Columbia has dissipated. The day is forecast to be very hot. The Asulkan Valley hike is 15 kilometers (9⅜ miles) return with a net elevation gain of 925 meters (3,035 ft) to the end of the trail near Asulkan Hut. This hike has been saved for the final day because many great reports about the Asulkan Valley experience may leave a lasting legacy. The Falcon Hiking Guide for Glacier National Park justifiably rates it as one of the Top Ten Hikes in the area based on Best Overall Views. The problem is that hiking does not seem attractive on this day. The lethargy is caused by being hiked out but it is mandatory to at least try. It will go one way or the other. Following a hearty breakfast at Glacier Park Lodge, the familiar 5 KM (3⅛ mile) drive to the Illecillewaet Campground parking area is completed and hiking begins at 8:15 AM. A quick jaunt on the 1885 Trail and a left turn through the old Glacier House foundations provides quick and direct access onto the Asulkan Valley Trail. The front end is familiar from previously hiking the Great Glacier Trail and soon that junction is passed. The trail is excellent and the musty aroma of old growth forest and wet moss is working its magic. The disposition is better and the hike is beginning to look like fun. 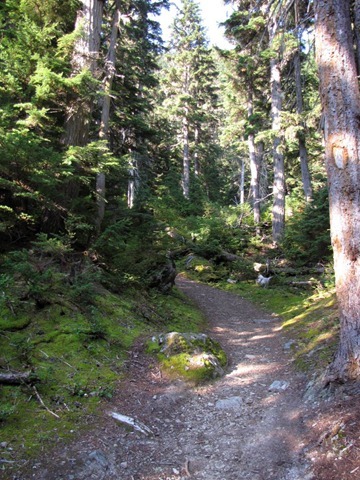 As the valley tightens, the hike alternates between forest and open trail. The sun is warming up the day. Hiking beside Asulkan Brook proceeds through large rock falls. Hoary marmots are basking in the sun on top of large boulders as they monitor progress. Huge waterfalls are roaring straight down from the steep slopes of Abbott Ridge on the other side of Asulkan Brook. The sound echoes and amplifies in the massive rock falls. After crossing a removable wooden bridge over Asulkan Brook, the trail soon passes the junction for the Glacier Crest Trail. Breaking out from forest again, the Asulkan Glacier comes into view far in the distance. The farther the hike continues, the more spectacular the scenery becomes. Roaring, rushing, milky water is everywhere. The sun is dancing on water and shadows shorten as the sun begins to fill the valley. There is a feeling of excitement now of being committed to completing the hike. Asulkan Valley is a truly phenomenal hike and, so far, there has been only a hint of what will unfold. The quality of the trail remains good as the ascent gradually gains elevation more aggressively. Crossing the dual aluminum plank bridge across Asulkan Brook, there is a short section of forest before climbing up the top of a lateral moraine. The pitch gets steeper. The amazing ridge walk, with a valley down to the left and unfolding glaciers up on the right continues with building anticipation. The nature and rugged surface of the narrow trail demand attention and compromise. The ascent continues with abandon and it just keeps getting better. There is more ice revealed with every step. Pink-tinged algae grows on ice and snow slopes. Asulkan Hut and the outhouse are a short distance away. Gear is left at the cairn and a photographic tour of the hut and bowl below the Asulkan Névé begins. An ascent to the top of a knoll proceeds above the locked and currently uninhabited Asulkan Hut which is managed by the Alpine Club of Canada for mountain climbers requiring temporary accommodation for staging climbs to local mountain summits. This particular hut can accommodate up to 12 adventurers. From the top of the knoll a brief video is captured of the magnificent surrounding mountain scenery. Surrounding scenery is breathtakingly beautiful. Click here to enjoy the video of spectacular surrounding scenery from the top of Asulkan Valley. The weather is perfect. At this altitude the cool air balances perfectly with the powerful sunlight. Lunch is consumed in a sunny, sheltered spot while gazing across the bowl to the glacial pond being fed by melt from glaciers above. Small waterfalls tumble over rock ground smooth by the recession of massive ice over thousands of years. The sound of falling water bounces from sheer rock surfaces that deceive its accurate location. There is a reluctance to leave. It is important to get to lower elevations before the oppressive heat and humidity of mid-afternoon sun. The refuge is back into the forest. The Asulkan Valley hike is, hands down, one of the best day hikes ever achieved in my lifetime. The next day, departure occurs at day break for the 440 KM (275 mile) drive back to Calgary with a stop in Golden for breakfast and gas for the car. One more stop is made to photograph a dynamic sky for a fitting end to this incredible journey and adventure.